It’s official, fall sports have begun. The volleyball and men’s soccer teams had their home opener this past weekend while women’s soccer and cross country started their season off on the road. On Aug. 31, the Spartans kicked off their season against the West Florida Argonauts. The two teams ended the game in a tie after battling through a double overtime. Tampa dominated the first half, tallying five shots on goals, with two being from junior forward, Juancho Fernandez. During the second half, Marcel Salokat, grad forward, had an opportunity to put Tampa in the lead when he hit the crossbar 63 minutes into the game. After 90 minutes of game, the game went to overtime, where Tampa pressured the Argonauts by tallying five shots on goal. The Spartans will be playing against North Georgia on Sep. 6 at Georgia, on Sep. 8 against Clayton State in Georgia and back at home on Sep. 12 against Thomas University. 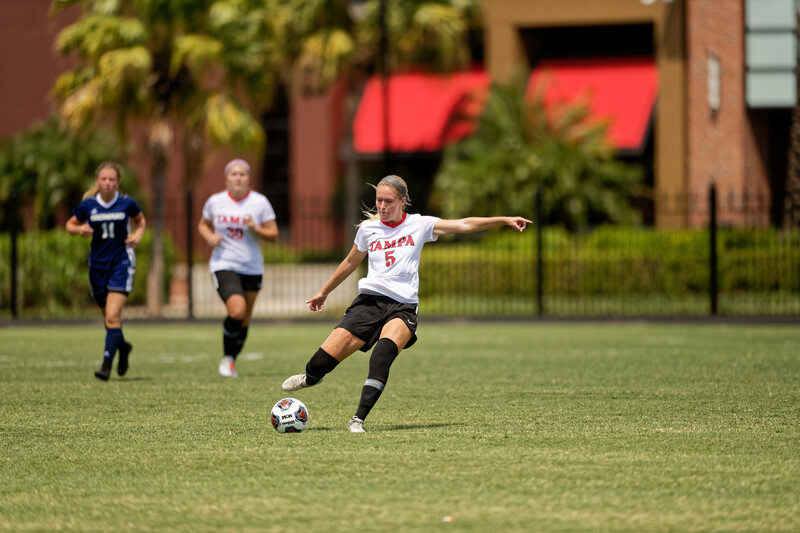 The Women’s soccer team started their season on Aug. 31 against West Alabama which ended in a high scoring tie between the two teams. The match resulted in a 4-4 draw, where the ladies played two 10 minute halves of overtime. In the first half, West Alabama started scoring in the first four minutes of the match. TeMia Pride, Tigers’ forward, scored her third goal of the season 39 minutes into the game. However, 42 minutes in Erika Peitersen, sophomore midfielder, struck the first goal for UT. West Alabama led the game 3-1, 44 minutes in when Kayla Butterworth scored against UT. Less than one minute later, Emily Cady, junior forward, got the Spartans a goal staying only one goal away from the Tigers. In the second half, Lacy Nasello, junior defender, tied the game up with a goal 49 minutes in after a corner kick from Alexa Sheridan, senior midfielder. UT took the lead 54 minutes in when Cady scored her second goal of the evening. With less than 10 minutes remaining, UT fouled the Tigers in the box, creating a penalty kick for the Tigers. The second half ended in a 4-4 tie. During overtime, the Spartans had five scoring chances compared to West Alabama’s two shots on net. The Spartans will be back playing against Queens University on Sep. 7 and on Sep. 9 against Lenoir-Rhyne University, both home games. The UT men’s cross country team began their season on Aug. 31, taking home a first-place finish from the Valdosta State University Invitational. The team had their season opener at Valdosta’s home course in Georgia, where the men ran a 7.25 kilometer course. Even though the course was on rocky and wooded terrain, UT’s sophomore Trevor Kattenberg finished in first place completing the race in 23 minutes and 50 seconds. Junior Tyler Roberts followed Kattenberg to take second. He finished the race just five seconds after Kattenberg in 23:55. The team was able to place their top five finishers in the top 13 positions of the race. This was crucial to be able to take first place. Joe Webber, senior, came into the finish as UT’s third man. Michael Wilson, sophomore, and Devon Sullivan, freshman, finished in the fourth and fifth in the race. Men’s cross country will be representing the Spartans on Sep. 8 in the Florida Tech Invitational in Melbourne. Along with the men’s team, UT women’s cross country also participated in the Valdosta State University Invitational, raking in a first place finish. Sophomore Zoe Jarvis, completed the 5K race in 18 minutes and 47 seconds, coming in first in the invitational. Shannon Sweeney, grad student, was the second athlete to finish the race with a time of 18:59. Sweeney is a former UT lacrosse player and played under Coach Kelly Gallagher for four years prior to joining the cross country team this year. She had only two years of running experience from high school before the season. Following Sweeney, was junior and captain of the team, Julia Lockridge, taking fifth place overall in the race. Next was junior captain, Lexi Bible, and sophomore Monika Brill. The women were able to place their top five athletes in the top seven competitors and their top 10 athletes in the first 14 positions of the race. After tallying these results, Tampa women’s cross country won the invitational by 25 points. Women’s cross country will be also racing at Florida Tech Invitational on Sep. 8.